This map portrays the geodynamics of Northeast Asia at a scale of 1:5,000,000 using the concepts of plate tectonics and analysis of terranes and overlap assemblages. The map is the result of a detailed compilation and synthesis at 5 million scale and is part of a major international collaborative study of the Mineral Resources, Metallogenesis, and Tectonics of Northeast Asia conducted from 1997 through 2002 by geologists from earth science agencies and universities in Russia, Mongolia, Northeastern China, South Korea, Japan, and the USA. This map is the result of extensive geologic mapping and associated tectonic studies in Northeast Asia in the last few decades and is the first collaborative compilation of the geology of the region at a scale of 1:5,000,000 by geologists from Russia, Mongolia, Northeastern China, South Korea, Japan, and the USA. The map was compiled by a large group of international geologists using the below concepts and definitions during collaborative workshops over a six-year period. 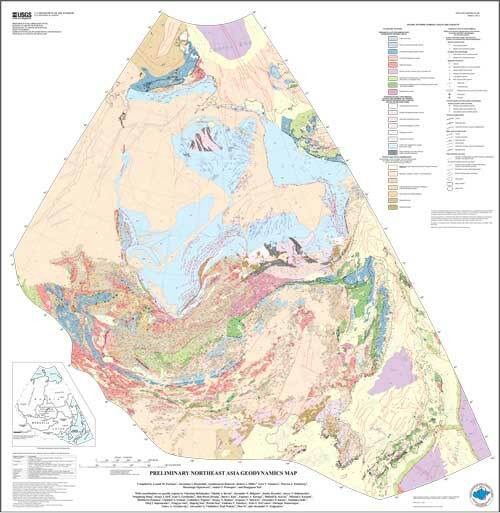 The map is a major new compilation and re-interpretation of pre-existing geologic maps of the region. The map is designed to be used for several purposes, including regional tectonic analyses, mineral resource and metallogenic analysis, petroleum resource analysis, neotectonic analysis, and analysis of seismic hazards and volcanic hazards. The map consists of two sheets. Sheet 1 displays the map at a scale of 1:5,000,000, explanation. Sheet 2 displays the introduction, list of map units, and source references. Detailed descriptions of map units and stratigraphic columns are being published separately. This map is one of a series of publications on the mineral resources, metallogenesis, and geodynamics,of Northeast Asia. Companion studies and other articles and maps , and various detailed reports are: (1) a compilation of major mineral deposit models (Rodionov and Nokleberg, 2000; Rodionov and others, 2000; Obolenskiy and others, in press a); (2) a series of metallogenic belt maps (Obolenskiy and others, 2001; in press b); (3) a lode mineral deposits and placer districts location map for Northeast Asia (Ariunbileg and others, in press b); (4) descriptions of metallogenic belts (Rodionov and others, in press); and (5) a database on significant metalliferous and selected nonmetalliferous lode deposits, and selected placer districts (Ariunbileg and others, in press a). Compiled by Parfenov, Leonid M., Khanchuk, Alexander I., Badarch, Gombosuren, Miller, Robert J., Naumova, Vera V., Nokleberg, Warren J., Ogasawara, Masatsugu, Prokopiev, Andrei V., Yan, Hongquan, 2003, Preliminary Northeast Asia Geodynamics Map: U. S. Geological Survey Open-File Report 03-205, http://pubs.usgs.gov/of/2003/0205/.